Whew. I’ve had a few bad days in the kitchen. I’ll spare you photographs of the disasters. I’ve been thinking about each and every one, however. And each failure reinforced my intention to write recipes that work. You see, each of these, um, challenges in the kitchen was about the quality of the recipe, I’m sure of it. I tried making macarons from a recipe found at a very reputable site. There were technique suggestions I’d never seen before. I made the recipe three times. The first time, clearly the baking time was wrong as they were deeply brown two minutes before they were even supposed to be done. The second attempt produced flat, no-feet cookies from the outset. The third time, the cookies formed and some even made little feet, but the tops cracked and collapsed on themselves. I even omitted duck egg whites because I wondered if they had some sort of different chemistry. There’s something wrong with the recipe. The ratio is different than other macaron recipes so I should have known, right? I’m just going back to what worked. And I’m going back annoyed. And this was not the only failure. I began to worry I’d lost my mojo. as I was throwing food away and muttering under my breath. Thinking about my own recipes. Generally, I’ve tested a recipe three or four times before I publish it, but will admit to also enthusiastically blogging a recipe that I’ve just made up, served for dinner, liked a lot, and wanted to share. I hope in either instance, the recipe will work for you. And please, won’t you let me know if something doesn’t work, or – especially – if you’ve made an improvement? Kim and I are working on a book proposal. I’m writing and testing recipes all the time now, and trying to develop some sort of consistent way to communicate the information. This great piece of advice from JustCookNYC has me more conscious of the way I provide the information, write the instructions, and use photographs to explain technique. Here’s what I know for sure – I don’t want to disappoint any of you. On an up note, this weekend I did try some wonderful recipes, linked below, with my tweaks. These were wonderfully written and the results were perfectly delicious. 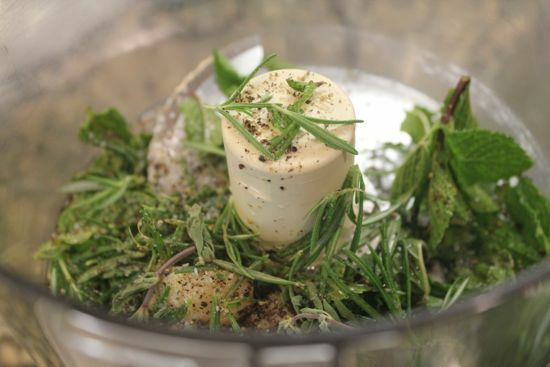 In the food processor, blitz all the herbs, garlic and oils. In a large bowl, combine the lamb with the herb mixture, massaging the marinade into the meat. Heat the gas grill to medium high. Allow it to heat up to 425° – about 20 minutes on my grill. Work quickly using your asbestos hands and long tongs. Place the lamb pieces on the grill, turn the heat down to medium and close the lid. Prepare foil to be used to rest the meat after grilling. You want two large pieces of foil at the ready. Grill for seven minutes. Turn the meat – if it sticks, stop trying to turn it, close the lid, and cook two minutes longer. When the meat is ready to be turned, it will release easily. Grill for another 5-7 minutes on the second side and remove from the grill. There should be pretty grill marks on both sides. Pretty grill marks only happen when you don’t mess with the meat. Rest the meat for 10 minutes. 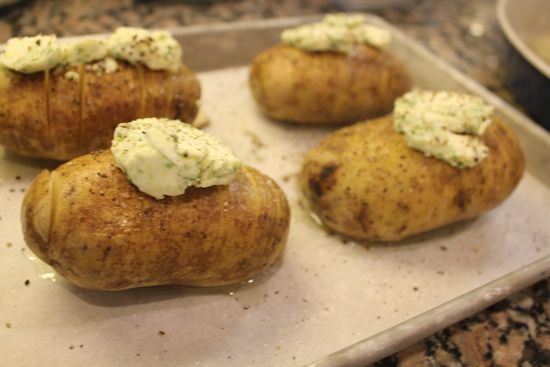 My tweaks – due to the appearance of spring chives in the garden and the last of a jar of garlic confit – I made a composed butter of chive, butter, salt and garlic confit, chilled it well, then placed a fat pat of buttery goodness over the top of the oil drizzled, salted and peppered, fan-cut potatoes. These spuds were amazing. Seriously, totally, utterly, knock me over with a feather fantastic. It takes only 45 minutes, so it’s a great weeknight idea to fancy up dinner. I mixed together olive oil, red pepper flakes, oregano, salt and pepper and poured this concoction over stemmed, trimmed artichokes. Roasted at 425° for 45 minutes (right along side the potatoes.) Once opened up, the interior heart and leaves were tender and exceptionally flavorful. I used this curd to fill the not-so-pretty macarons. And today, I plan to use the rest of it for a similar shortbread cookie. You never disappoint. Things don’t always come out the same for everyone. Your lamb looks really good! You can cook for me even when you think your mojo is gone. I know it isn’t. Oh my goodness. I go through these phases where nothing I do in the kitchen turns out well at all. I just went through one where even my chicken picatta (one of my best dishes!) didn’t come out quite right. It really messes with me when that happens. I get all wobbly and unsure of myself when I am off my game in the kitchen. I finally redeemed myself this weekend by making 25 lbs. of yummy Italian meatballs and some good, homemade spaghetti sauce from my grandmother’s recipe. Your mojo isn’t gone, it’s just taking a short break and will be right back. 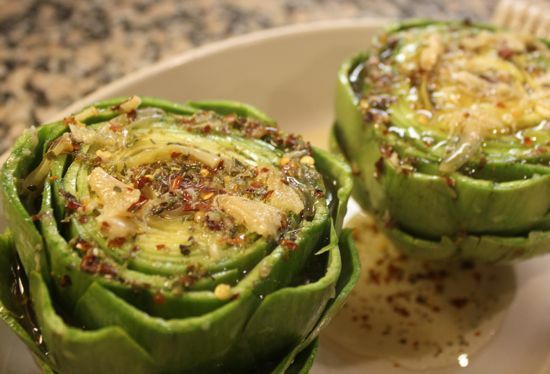 PS – The recipe for roasted artichokes has me hungry for some at 9:30 in the morning! I hope you try those artichokes. I can’t stop thinking about them! I’d like my mojo back as well if you find it searching for yours. Vacation has completely stolen mine away. I’ve always found no matter how much I test a recipe, sometimes it will always vary from kitchen to kitchen. I love getting feedback though from people who have tried it, it helps me improve what I’m doing! I had the same problem with the baked beans, using old beans. Also I used a cast iron pan, and they taste a little metalic after the long period of time in the pan. So not an unmitigated success. But they were both issues I could have anticipated with a little thought . . .
My mojo and my blog I want back. My blog has disappeared…It was kidnapped and I cannot get it back either from google not blogspot. I have lost 13 months of posts and all my followers. I am now working on my new with WordPress and should be back in full swing by mid May…I really enjoy your posts….. Thanks, Norma. What a collosal pain in the neck! Hope your WP blog goes well. I’ve been really happy since switching over. Otherwise known as hedgehog potatoes–love those! Thos e beans were terrific and I will make them agian no matter how long! It is the acid–I did a bunch of reserach this weekend and here’s the best expanation I have found: DON’T ADD SALT TO THE WATER! Adding salt or any acid (like tomatoes or vinegar) to beans hardens their skins and prevents them from cooking properly. In most instances, it’s best to add salt AFTER the beans are almost entirely cooked. 2. When pressure cooking soups, adding a small amount of tomatoes or using a lightly salted stock may lengthen cooking time slightly, but does not prevent the beans from softening. The fact that you test, and test agian and ask othjers to test is a testament to your dedication to this art we all love. Amazing information! Thank you Sharon. I’ll echo what Janis said, “Things don’t always come out the same for everyone.” Recipes, the writing and in some cases the using, is ridiculously hard sometimes. It drives me nuts when I spend all day making something “difficult” and it’s not that great. Then other days I throw something together without much rhyme or reason and Brenda tells me it’s one of the best things I’ve ever made (and then I wonder if I can repeat it!). I suppose it comes down to YMMV: your mojo may vary. Ha! YMMV. I’m going to use that. Thanks for the tater love, Cathy. And I’d like to echo that beans are always tricky little beasts, but despite the protracted cooking time, they were outstanding. I will definitely make them again… (although I may add the tomato portion of the program in after the beans have had a bit of time to tenderize in the oven already.) The flavours, though, were so outstanding that every second of those 9 hours was worth it!!! Make the beans folks! My husband grows dried beans for a living. There have been many times we have held them in storage for over 18 months for the price to go up…so by the time they hit the shelves they can be 2 years old. I learned the hard way. I used freshly harvested dry beans in a recipe…soaked overnight and then cooked the H_ll out of them: MUSH. I also don’t cook with tomatoes or salt until AFTER they are cooked through and soft. Really great information. I think the next time, I’ll let the beans cook nearly all the way through before adding the tomatoes (as Rebecca suggested.) We eat so many beans – at least twice a week – and I love learning all these tips. This remind me of the time at Soupergirl when we were making a bean soup. Three of the pots were done at the regular time. The beans in the fourth pot never got soft – NEVER. After four hours of extra cooking they still weren’t done. We ended up pureeing the fourth pot and mixing all of them together. So sometimes it’s not the recipe that’s wrong, it’s the beans. That’s so exciting that you’re working on a book proposal! Good luck! Oh my gosh Cathy. You have no idea how timely this is for me. After two years of blogging and only positive comments up until this point, I got two negative comments last week about my recipes (not the same one). And it really bummed me out… I feel like I ruined someone’s meal because the recipe of mine they made did not turn out as planned 🙁 I am feeling just like you- that I need to be super careful about recipe writing and testing…I really want my recipes to work every time. I’m pretty sure your mojo will be back very soon, and I hope mine is, too! Macarons are fickle fickle things! Also humidity & air pressure have some funny effects on them. 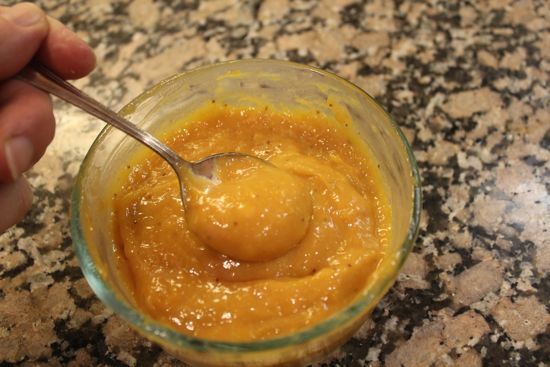 Even with the best recipe, it’s possible to get less than desirable results. I think it took me 6 tries before I got a decent looking macaron. Did you use French or Italian method? We should get together and have a macaron baking party! 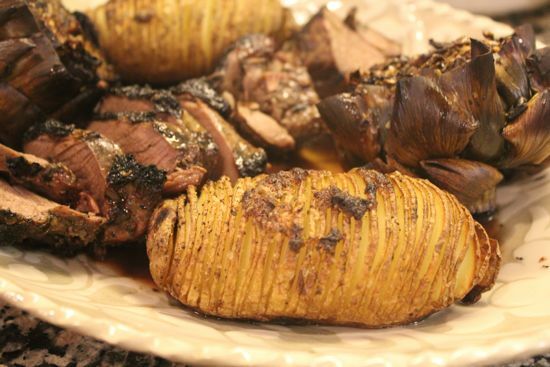 Your roasted hasselback potatoes look gorgeous! I’ve had a lot of luck with macarons…. 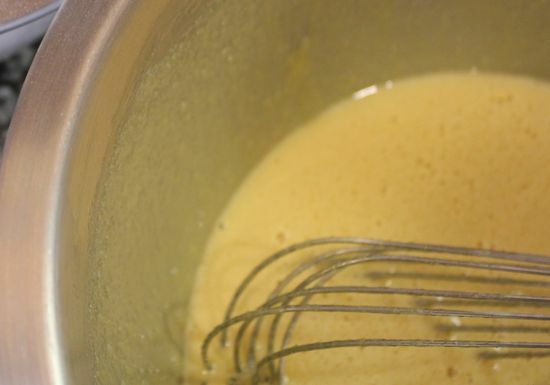 the recipe I tried cut a lot of corners – no aging of the egg whites, etc… and I think it just didn’t work. I’m going back to my favorite recipe and sticking with it! And yes, let’s make ’em together some day! How fun would that be? I am neither a food blogger nor a recipe writer. Instead, I am an avid recipe hunter and blog & cookbook reader, someone who cooks and/or bakes nearly every day, and I like to try both easy and complex ideas—in other words, the target market for recipe writers. The list from Justcook NYC is fantastic. To number (6), I would add a reference to any unusual cooking tools needed as well. (1) Know the target audience. If a writer wants a novice cook to be able to understand a recipe, it needs to be presented that way. I liken it to college literature courses: everyone can take a 100-level course, participate in the discussion, and write an excellent paper; a more advanced student might deliver a more sophisticated paper or presentation, but a first-year student can still be a success. in a 500-level course, one that relies on an existing understanding of the subject matter, only a more advanced student can be successful. Both courses are terrific, they are just different in nature. The same with cookbooks. (2) Introduce the recipe. I love a recipe introduction in cookbooks. Set the mood. Tell me what to expect, both in terms of preparation time and expected result. Give me ideas about when or how to enjoy the dish. Share a story. Draw me in to the recipes with a short note, and I am much more likely to keep going back to the cookbook, and subsequent books from the author. (3) Separate each step. The best recipes, simple or complex, separate the steps. I am amazed at how many recipe authors group steps together; I understand that the author, someone who has made the recipe many times, likely thinks of many steps as one concept and therefore groups them together. But for someone following a recipe for the first time, each step is a discreet activity, and grouping them together as one makes it much more likely that we will miss something, or just assures that we have to check the recipe so many times that it becomes frustrating. (4) Check for accuracy. Again, this one seems simple, but recipe writers should check that the measurements provided in the ingredient list match the amounts included in the recipe below. (5) Have recipes tested by someone outside of the author’s immediate circle. This one is not all that important for blogs, which can be adjusted anytime, but for a published book, it is always very easy to tell which authors have had other people test the recipes, and which recipes were only made by the author or similar folks before publication. Never assume that other people will understand the steps. Very excited for the book (which I am sure will be published)—and I am already thinking of the fantastic signings you are sure to have, hopefully including at Politics & Prose! Sarah, Thank you for this really helpful comment. I hope when we next see eachother at Whole Foods, we’ll have time for a coffee. Clearly, I need to pick your brain! Disaster happened to me & my hot cross buns or rather rock cross buns! Sadly though I am sure that was me rather than the recipe!